Have been overdue a favourable result on the horses. Best bet of the day, Juarla, trots up @ 9/2 having taken 9/1. What's more no rule 4 deductions which means close to 20 points profit. Small interest tonight but could be quite a bit of action tomorrow night with Newcastle, Hamilton and Goodwood all possible venues for wagers. Touched off a neck for a good priced double at Lingfield. Rule 4 on the winner means odds reduced to 2.55-1. The other one (second) backed from 9/2 to 11/4 and couldn't get up close home. Li Na wins a topsy turvy final in Cincinnati. New coach Carlos Rodriguez plays a big part in my opinion pulling things around after the loss of the first set 6-1. Greatest thing though about Carlos being Li's coach is hubby NOT being coach! Disaster. Plenty of good value losers. Majestic Dream backed from 10/1 to 9/2 JT favourite. Last. Bertiewhittle from 12/1 to 7/1 tailed off. Jarrow 9/1 to 7/1 never in it. Harry Trotter 9/2 to 15/8f. Second. Leadenhall Lass 13/2 to 5/1. Second. And so it goes on. Maybe one race tomorrow but priority will be tennis court. Li Na the main bet though. Cut by Ladbrokes to 25s but still 33s with skybet if you can get on. I was offered £1.52p at the price. We have an interest in the men's event with 14/1 Fed to win two grand slam events this year @ 14/1. For the women's event Serena Williams is around even money whereas the holder - Sam Stosur - is 50/1. Perhaps shows us we were a bit unlucky last year when on the younger Williams sister at a big price. Anyway enough of that. 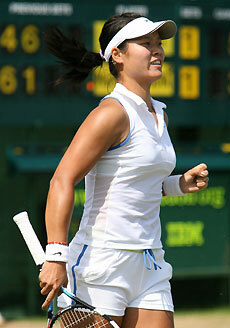 Li Na has just employed Henin's old coach and that might just bring the improvement needed to win another grand slam. Judging by her demolition of Aggie last night it looks like it's already providing dividends. Li's husband obviously takes no further part! Ground is good at Ripon as I write but this could change by the morning as heavy overnight rain is forecast. Whatever the ground the main debate will be about which side of the track is favoured. Eight of last ten years it has been the far side (low), but not last year. All with William Hill and include BOG protection. A good day. Profits at Beverley and Chepstow. At the latter the 9/2 winner Tanforan became a 3.15-1 shot after the inevitable rule four kicked in. Just slipped up with the Gypsy stuff. They seldom win when they drift that badly...15 points in front for the day though. Action at Newcastle, Nottingham and possibly at Kempton tomorrow. Possible further bet at Chepstow. Strange ride by Hughes on Dare To Dream. Never ever put the horse in the race. Interestingly there was late money for the stable companion - ridden by RLM - which finished as runner up just a head away from winning. Hmm. When the Salisbury failure was followed by our first Kempton runner Kinglami leading by five lengths at the furlong pole (and losing on the line), I thought it was going to be a horrible day. However Glass Office and Intransigent both won well albeit with rule four deductions for significant non-runners. In the end I lost half a point on the day - what a waste of time! Tomorrow I expect to be involved at Chepstow and Beverley. Half of last twelve visitors to the blog were more interested in the photograph of JG posted back in February than the betting exploits published since! Judges! Possibly one more race to follow. Additional bets in the morning. There is even worse news than a blank day today with Majestic Zafeen being done a short-head on the line at Kempton. Worse news? Yes, if you've not seen the front cover of Tuesday's RP you have a treat install. Clare Balding is to front C4 racing from Jan 2013. You may well be a fan but having kicked football into touch I can see terrestrial racing going the same way. Only Willie would have been worse! Check betfair for possibly higher quotes. Possible further bets at Kempton. For the first time in more than 20 years I have not bought the Racing Post "pull-out" guide to the forthcoming football season. Part of my "legacy" of the Olympics is my realisation of how much I hate our national game. The thought of MOD on the horizon fills me with absolute horror. The Olympics has confirmed how much I hate everything about football, from its tribal fans with their ludicrous deluded possession of the players and the clubs to the money grabbing low-life players themselves: Rooney, Tevez, Terry. I have made a good start, post Olympics. I didn't watch a single minute of the Community Shield yesterday even though I was ill in bed and it would have been easy to do so. I did not back Tevez or Torres for TGS when I discovered they had scored. I have not had a football ante-post bet and I do not intend to. I will have to spend all the time saved from not watching football either in the gym or on the tennis court. A far better prospect than wasting two hours waiting for some (usually) thoroughly unpleasant characters to score a couple of goals. How we laughed when the parody of the Olympic organising committee talked Jube-Olympics, sustainability and legacy. Now the Olympics have been and gone. I feel privileged to have been a spectator, having witnessed (almost certainly) the best two Olympic tennis matches to take place - The Fed v Delpo and Mugray v Djoko. As for the betting? A disaster: too much staked and no returns. What now for the magnificent Olympic Park buildings: the Stadium, the Aquatics Centre, the Velodrome? Out of jail in the last again as Mayo Lad gets up in the shadow of the post. Backed from 9/4 to 6/4. The other Irish-named horse Irish Boy was backed from 9/2 to 11/4 and just failed to get up by a neck. Superior jock on the winner. No damage on the day though. Still lost a few points on the day but could have been a lot worse. Plus 1pt ew double the above two at the prices. Not everyone's cup of tea but the renewal is staged at Ascot tomorrow. The races, as you'd expect, are incredibly competitive. In the one race where there was a warm favourite - the stayers - we have an early non-runner: Western Prize which will be a blow to Take and the International team as this one could have gone off around 5/2. It would not surprise me if the RP went for GB/Ireland so it may prove best to take the price now rather than wait until tomorrow. No good today. Very disappointed with Buick in the Sandown race. Rode a terrible race IMO. Annoying because I could have made a case for the winner. Still can't get it right. Mind you, it won't be long before the 50th anniversary of my first ever bet. Not a lot of time, therefore, to get it right! Olympics' medal markets have been a disaster. Apologies to all who got involved. Total 5.5 plus last night's bet. Interesting cards tomorrow at Sandown, Chepstow and Haydock. Huge staking day with 20.5 points laid out in total. Two non-runners (return 3.5 points). Two winners: Alkadi won 13/2 (advised @ 10/1, no non-runners in race makes a welcome change) and Masarah won 7/2 (advised @ 15/2, R4 40p = 9/2). Total return on day 31.0 points. Plenty staked. 18.5 points to be precise. More to follow at Ripon and Bath. 0.5pt each-way double at prices. Off to Wimbledon centre court tomorrow. All the singles' semis are on here except the one I already have money on - Maria v Maria which has been moved to court one. Not too bothered about that as have seen Pova playing a couple of times in Birmingham. MaKiri has a chance on her best form having taken care of Kvitova in straights today. On centre Federer v Delpo is followed by Serena v Vika and then Mugray v Djoko. Williams sisters end the programme with a doubles against MaKiri and sourpuss Petrova. First two look like going to the favourites but I think Mugray has a real chance of winning his semi with the crowd support behind him. H2H is 8-5 Djoko, but two of the Djoko wins were on clay. The Scot looks so fired up I think he's worth a play. I have had 4pts @ 7/4 Mugray to beat Djoko with Paddy Power. My each-way selections in the men's event are already on their way home so you may not wish to read any further. Serena is now a very warm favourite to lift the ladies' title. However she makes the market conducive to each-way betting in the bottom half of the draw. This features Clijsters against Sharapova and Kvitova versus Kirilenko. The market will tell you the bottom semi will be Masha v Petra, however I thought Sharapova was very poor today. Lisicki should have beaten her. Pova served three double faults in ONE game to go a set and a break behind. Lisicki responded immediately with three double faults of her own to level the match (Tracey Austin - "A stunning come back by Sharapova", what tosh, I could have won that game if Lisicki had served me three double faults!). Kim Clijsters has moved quietly through the draw and has not lost a set in reaching the quarter-final. She can be backed at 22/1 to win her penultimate tournament, Pova is no bigger than 11/2. Don't be surprised to see a Pova v Kvitova semi-final! !